Myth: Americans think government spending has increased dramatically, especially under the Obama administration. 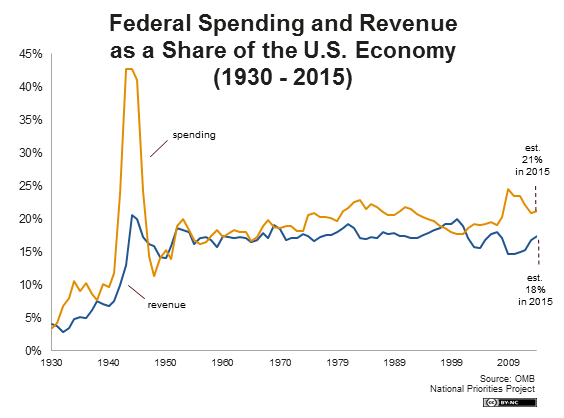 Fact: Government spending as a percentage of GDP has been remarkably stable since World War II, and actually fell during the Obama administration. Myth: Roughly half of Americans think the government should be run like a business. Fact: Government and business have entirely different missions and methods of measuring performance. Myth: Less than half of Americans know that raising the debt ceiling doesn’t increase spending and a majority oppose doing so. Fact: Raising the debt ceiling only allows the U.S. to pay debts on already-approved spending, and is critical to avoid a crippling default. It’s reasonable to be somewhat skeptical or even suspicious of government, but a large portion of Americans have lost all faith, believing that government is almost never a solution and nearly always makes things worse. Many have no idea how the government borrows and creates money. They think government grows like a cancer, especially when Democrats are in charge, destroying liberties and sapping economic vitality through excessive taxation and “job-killing” regulations. And, they think government is a profligate spender without the fiscal discipline of business or even a household. But is any of that true? Most of the economic data and evidence shows that those beliefs are not supported by facts. At Civics Nation, we do not believe that government is the best solution to every problem, but we do believe that in some cases government offers the best—and occasionally the only—solution, especially when free rider problems exist. Is Big Government Bad Government? U.S. Healthcare: Do We Spend Too Much or Too Little? Do We Live in an Era of Big Government?